My Note: How did we miss this? This is from UK where titles are more prevalent and used daily. Maybe this will catch on in the US however it certainly does out one as gender nonspecific. It took a while for "MS" to catch on for someone who wanted to be nonspecific as to her marriage status. It was not until feminist saw it as a professional and independent female title that it caught on. I much appreciate the term “MS” and use it myself. Here is the Wikipedia description on “Ms” and its modern acceptance. In 1961, Sheila Michaels attempted to put the term into use when she saw what she thought was a typographical error on the address label of a copy of News & Letters sent to her roommate. Michaels "was looking for a title for a woman who did not 'belong' to a man." She knew the separation of the now common terms Miss and Mrs. had derived from "Mistress", but one could not suggest that women use the original title with its now louche connotations. Her efforts to promote use of a new honorific were at first ignored. Around 1971, in a lull during a WBAI-radio interview with The Feminists group, Michaels suggested the use of Ms. A friend of Gloria Steinem heard the interview and suggested it as a title for her new magazine. Ms. magazine's popularity finally allowed the term to enjoy widespread usage. In February 1972, the US Government Printing Office approved using "Ms." in official government documents. In 1976 Marvel Comics introduced a new superhero named "Ms. Marvel," billing her as the "first feminist superhero." So is "Mx" something we should lobby and want to move into general use? How do you feel about this? I do see this as a positive occurrence in that being transgender moves further into the mainstream. 'Mx' I am not so sure. A new gender neutral title 'Mx' is to join the honorifics 'Mr, Mrs, Miss and Ms' on driving licenses and other official documents, the first change to officially recognized titles in decades. 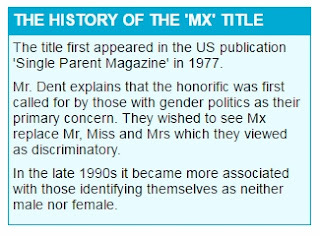 Royal Mail, high street banks, government departments and some universities all now accept Mx which is used by transgender people or other individuals who do not identify with a particular gender. Oxford University introduced the title last year and has explained that it is 'the most commonly used and recognized gender neutral title'. The title has been added, without fanfare, to official forms and databases and is under consideration by the Oxford English Dictionary for inclusion in its next edition. Very interesting but I still prefer to be addressed in the feminine.